This study is complementary to a line of research financed by the 'Centro de Alto Rendimiento y de Investigación en Ciencias del Deporte' (Centre for High Performance and Research in Sports Sciences 'Consejo Superior de Deportes' (Sporst Council), reference number: 06/UPB20/02). The sample used is the bases of this line of research. This paper gives an analysis of personal and environmental variables related to aggressive and unsportsmanlike behaviours in a sample of Spanish sports competitors. We aim to: 1) ascertain how personality and expression variables relate to trait anger control and unsportsmanlike behaviors, in relation to men and women, age groups and type of sport, 2) identify and analyze the most maladjusted and the most adjusted profiles in a sample of sportsmen and women; 3) identify personality variables as predictors of aggressive and unsportsmanlike behaviours. Differences in gender, age and type of sport were appreciated in personality variables and in aggressive and unsportsmanlike behaviours. Men have better emotional adjustment (more behaviours of emotional stability, better self-esteem, self-confidence and leadership), and have worse social adjustment (fewer behaviours of tolerance, social skills and responsibility; more aggressive and unsportsmanlike behaviours). Women have better social adjustment (more behaviours of tolerance, understanding, adaptation, responsibility, discipline and sociability), and have worse emotional adjustment (greater anxiety). More aggressive and unsportsmanlike behaviours and greater emotional maladjustment were found in the youngest sportsmen and women. Aggressive and unsportsmanlike behaviours were more frequent in team sports. This study highlights personality variables as predictors of aggressive and unsportsmanlike behaviours. Key words: Aggression; anger; personality; sport; competition; gender; unsportsmanlike behaviours. En este trabajo se analizan variables personales y ambientales relacionadas con conductas agresivas y antideportivas, en una muestra española de deportistas competidores. Los objetivos son: 1) Conocer la relación entre variables de personalidad, de expresión y control de la ira rasgo y conductas antideportivas entre hombres y mujeres, grupos de edad y naturaleza del deporte; 2) Detectar y analizar perfiles más desajustados y más ajustados en la muestra de deportistas; 3) Identificar variables de personalidad predictoras de conductas agresivas y antideportivas. Se apreciaron diferencias de género, edad y naturaleza del deporte en las variables de personalidad y en conductas agresivas y antideportivas. Los hombres presentan mejor ajuste emocional (más conductas de estabilidad emocional, mejor autoestima, autoconfianza y liderazgo), y peor ajuste social (menos conductas de tolerancia, habilidad social y responsabilidad; más conductas agresivas y antideportivas). Las mujeres, mejor ajuste social (más conductas de tolerancia, comprensión, adaptación, responsabilidad, disciplina y sociables), y peor ajuste emocional (una mayor ansiedad). Se detectó más conductas agresivas y antideportivas y mayor desajuste emocional en los deportistas más jóvenes. Las conductas agresivas y antideportivas fueron más frecuentes en deportes de equipo. El estudio pone de relieve variables de personalidad como predictoras de conductas agresivas y antideportivas. Palabras clave: Agresión; ira; personalidad; deporte; competición; género; conductas antideportivas. This study analyses the personal and environmental variables related to aggressive and unsportsmanlike behaviours in a sample of Spanish sports competitors. Several studies have analyzed a large number of personal and environmental variables related to aggressive and violent behaviors in sportsmen and women (Dunn & Dunn, 1999; Cecchini, González, & Montero, 2007; Leo, García-Calvo, Sánchez, Gómez, & Sánchez, 2008; Pappas, Mckenry, & Catlett, 2004; Pelegrín, 2005; Pelegrín, Garcés de Los Fayos, Jara, & Martínez, 2003; Sánchez, Leo, Sánchez, Amado, & García, 2010). Personal variables include age. A series of investigations have shown a higher incidence of aggressive behaviours during adolescence in the school population (Ianni, 1978; Ortega & Mora-Merchán, 1997; Pelegrín & Garcés de Los Fayos, 2009; Trianes, 2000) and in those who do sport (Pelegrín, Garcés de Los Fayos, & Cantón, 2010; Smith, 1975). There have also been studies about gender, which indicate more aggressive behaviour in men than in women (Garaigordobil & García de Galdeano, 2006; Moffitt, Caspi, Rutter, & Silva, 2003; Pfister & Sabatier, 1994; Pelegrín et al., 2010). Other variables related to aggression refer to emotional and social aspects. Emotional variables include: emotional instability (Caprara & Pastorelli, 1996; Coie & Kupersmidt, 1983; Ladd, Price, & Hart, 1990; Pelegrín, 2005, 2008); hostile perception and attribution of the intentions of others (Dodge & Coie, 1987; Fernández-Abascal, 1997); low frustration tolerance (Berkowitz, 1969; Cohen, 1955; Dollard, Doob, Miller, Mowrer, & Sears, 1939; Volkamer, 1971; Worchel, 1974); anger (Berkowitz, 1989; Chóliz, 2002); or low self-control (Dodge & Coie, 1987; Guerra, Huesmann, & Spindler, 2003; Pelegrín, 2004; Pelegrín & Garcés de Los Fayos, 2008; Trianes, 2000); selfcentredness and competitiveness (Pepitone, 1985; Slavin et al., 1985); high levels of stress (Molinero, Salguero, & Márquez, 2011, 2012). Among the social variables we can highlight lack of interpersonal skills (Coie, Dodge, & Coppotelli, 1982; Dodge, Pettit, McClaskey, & Brown, 1986; Ladd et al., 1990); behaviours of respect, concern, consideration and empathy (Eisenberg, Fabes, & Losoya, 1997); a low level of moral reasoning. Different studies (Bredemeier, 1985; Bredemeier & Shields, 1984, 1986) point out that in younger sportsmen and women aggressive and unsportsmanlike behaviour is more likely when levels of reasoning are low. Bredemeier and Shields (1984) describe children with a higher level of moral reasoning as being more assertive, sensitive and considerate, as well as being less aggressive that those who show lower levels of reasoning (e.g., Bredemeier, 1994; Orlick, 1990; Romance, Weiss, & Bockowen, 1986; Devís & Peiró, 1992; Cruz, Boixadós, Torregrosa, & Mimbrero, 1996). In the context of environmental variables, the relation between type of sport and aggression has been analyzed (Maxwell, 2004). In this case, aggressive responses could occur in relation to the level of contact or whether it as an individual or team sport (Endresen & Olweus, 2005). One of the pioneers in studying this variable was Voigt (1982). In his research, he related the nature of different sports to the number of fouls. He considered it relevant that aggressive behaviour was normally found to be associated with contact sports and his findings indicated that violent fouls were related to the regulations and current values of sport, such as winning. Another variable which fosters aggression in sport is competition orientation. In competition sports, the manifestation of violent and aggressive attitudes is more frequent in amateur sports (Rascle, Coulomb, & Pfister, 1998; Smith, 1975). Therefore, when competition is oriented towards a result, sportsmen and women develop a game which is characterised by greater tension - where play is precipitated and strategy is decreased. This situation could favour aggressive and not very sportsmanlike play (e.g., hitting, insulting, protesting, committing serious fouls...). Consequently, it is more likely for a sportsman or woman to show a more aggressive attitude, when the goal is oriented towards result and not towards learning or performance (Duda, Olson, & Templin, 1991). In this context, the result of winning / learning (home or away) has also been analyzed in several studies (Galen, 1986; Volkamer, 1971; Wolf, 1961). The conclusions indicated that more fouls were committed by both the losing and away teams. Providing aggressive models in professional sport can significantly influence the development of unsportsmanlike behaviours at early ages (Bandura, 1977; Huesmann, 1998). While a child contemplates a football game, he is receiving valuable information from players, trainers and relations. This information can be either an example of sportsmanlike behaviours, or on the other hand an example of unsportsmanlike behaviour. It will all depend on the actions of the main models. Afterwards, children will copy what they have observed because it is the alternative which they have been provided with to resolve a determined situation. Brustad (1993), Chelladurai and Saleh (1980) point out the importance of the trainers and parents' influence on transmitting values. In this sense, players' values and rules can determine the development of an aggressive and violent game. Compliance with the rules established in sport regulations is fundamental to encouraging sportsmanship. At present, aggressive and unsportsmanlike attitudes by sportsmen and women and fans have become a part of the concept of the sports spectacle. In sports events, it is usual to hear criticism and comments against referee decisions or about mistakes made by sportsmen and women. Gutiérrez (1998) highlighted how frequently the most basic rules of the regulations are broken because they are not directly penalised. Other authors (Lee, Kim, Greenwell, Andrew, & Mahony, 2006; Gutiérrez, 1995; Trepat, 1995) related the increase of aggressive and unsportsmanlike behaviours to the pursuit of triumph. (A more extensive revision of articles about aggression and violence in sport in the last 30 years can be consulted in Kimble, Russo, Bergman, & Galindo, 2010). The previous section outlines some of the most important personal and environmental variables related to aggression in sport and non-sport populations analysed in scientific literature. After this revision, we noticed that there are few studies which examine emotional and social variables related to aggressive and unsportsmanlike behaviours in competition sports. For this reason, in this study we are interested in looking at the relationship between personal (e.g., gender and age), emotional (e.g, consideration or social skills) and environmental (e.g., type of sport) variables and aggressive and unsportsmanlike behaviours in competitive sports. We aim to: 1) ascertain how personality and expression variables relate to trait anger control and unsportsmanlike behaviors, in relation to men and women, age groups and type of sport (individual or team; 2) identify and analyse the most maladjusted (risk) and the most adjusted profile in a sample of sportsmen and women; 3) identify personality variables as predictors of aggressive and unsportsmanlike behaviours. 468 subjects belonging to different sports clubs and federations in the Region of Murcia (Spain) participated. The clubs and federations were selected through incidental sampling, the sample of which was selected according to accessibility and guarantees for gathering information. The ages range from16 to 30 (M = 20.45; SD = 3.617). 62% are men (290 subjects) and 38.0% are women (178 subjects). 19% are professional sportsmen and women and 18% are amateur. 45.7% do an individual sport and 54.3% do a team sport. They train a mean of 8.59 hours a week (SD = 5.776). The age variable was divided into three intervals of five years: 1620; 21-25; 26-30. The groups were established on the basis of the international classification by UNESCO, recommended for age in socio-demographic, social and economic data (Department of International Economic and Social Affairs, 1982). State Trait Anger Expression Inventory (b): STAXI-2 (Miguel-Tobal, Casado, Cano-Vindel, & Spielberger, 2001). This is an instrument which permits the evaluation of different aspects of anger. It is made up of six scales (State of Anger, Trait Anger, External Anger Expression, Internal Anger Expression, External Anger Control and Internal Anger Control), five subscales (Feeling, Verbal Expression, Physical Expression, Angry Temperament and Angry Reaction) and an Anger Expression Index (IEI), which provides a general measurement of anger expression and control. For the 15 items corresponding to the state anger scale, the subjects grade the intensity of anger that they feel at "that moment" on a scale of 4 options of frequency from Not at all (A) to A lot (D). For the 10 items of the Trait Anger scale they express how they "normally" feel on a frequency scale of 4 options which go from Almost never (A) to Almost always (D). For the 24 items of Anger Expression and Control, the subjects grade how often they generally react or behave in a certain way when they are angry or furious. The same 4 frequency options described for the Trait anger scale are used. The STAXI-2 is a reliable test with a test-retest correlation of 0.71 on the Trait Anger scale, 0.77 on the Angry Temperament subscale and 0.70 on the Angry reaction subscale and on the Anger Expression Index. Values are meaning (0.69 and 0.64) on the Control scales, and lower on the Expression scales (0.59 and 0.61) and on the State anger scale (0.20). The latter can be explained by emotional state which is changeable over time. Cronbach's alpha coefficient indicates a good internal consistency for the scales: State anger (0.89), Trait anger (0.82) and Control (0.87 and 0.81); and for the subscales: Feeling (0.85), Verbal Expression (0.79), Physical Expression (0.78), Angry Temperament (0.84) and Angry Reaction (0.75). Values are somewhat lower for External and Internal Expression scales (0.69 and 0.67) and Anger Expression Index (0.64) due to the low number of items which make up these scales. (The State anger scales were not administered as they are not relevant to this study). Situacional Personality Questionnaire: CPS (Fernández, Seisdedos, & Mielgo, 2001). It has 233 elements which evaluate the 15 most consistent personality traits, such as: Emotional Stability: appraises aspects of general adjustment of emotions and affections; Anxiety: evaluates anxious reactions in different situations; Self-concept analyses personal valuation based on personal worth; Efficacy measures competence and efficacy in different behaviours; Self-confidence and Self-assurance evaluates confidence in one's own possibilities and resources and the assurance to face life events; Independence, evaluates the tendency to act without taking the interests of others into account; Dominance evaluates the tendency to direct others and organize activities; Cognitive control, evaluates management of cognitive self-control processes and skills in different situations; Sociability analyses disposition towards social relations; Social adjustment evaluates social behaviour and degree of adaptation to the family, school or work circle; Aggressiveness evaluates aggressive tendency and type of reaction when faced with the difficulties and frustrations that arise in life; Tolerance evaluates the level of independence of thought and action with respect to how others behave and act and where they come from; Social Intelligence appraises the capacity to adapt intelligently to different environmental and social situations; Integrity-honesty analyses the capacity to act as a responsible, serious person who complies with their duty and obligations; and Leadership, capacity to lead groups, organize activities and achieve goals. It also includes 3 measurements for validity of answers Sincerity measures the freedom to express oneself without pretending; Social desirability studies whether subjects distort answers to questionnaire; and Control of responses validates coherence or discrepancy in questionnaire answers. It has a two option answer: True or False. With respect to its reliability, none of the coefficients are below the value of 0.88, with the exception of the validity scale Control (value 0.71), and in more than half of the scales they are equal to or higher than 0.90. Questionnaire of unsportsmanlike and aggressive attitudes drawn up ad hoc. It is made up of 25 items which include unsuitable attitudes and behaviours towards other sportsmen and women, referees or trainers. Each item contains a frequency scale of 4 options that go from Almost never (A) to Almost always (D). The instrument has a high internal consistency with a reliability coefficient of (Cronbach's Alpha = 0.84). This questionnaire was drawn up for a research project financed by the 'Centro de Alto Rendimiento y de Investigación en Ciencias del Deporte' (Centre for High Performance and Research in Sports Sciences) 'Consejo Superior de Deportes' (Sporst Council), reference number: 06/UPB20/02). The procedure involved going to the centres where the sportsmen and women train and the questionnaires were administered in the classrooms made available. Before administering the questionnaires, the group of sportsmen and women were told in detail about the object of the research and that the questionnaires they answer would be anonymous. The administration of the questionnaire was done in groups by expert psychologists. The coding and analysis of the data was made with carried out using the SPSS 15.0. Statistics Program Descriptive analyses were made, reflecting percentages, means and typical deviations. The T-Test was used for independent samples, the one-factor analysis of variance was used for post hoc tests (HSD by Tukey), the Pearson correlation coefficient and Multiple Lineal Regression, using the successive steps method. The analyses have been made at the 95% confidence level. The T-Test results of the variables show significant statistical differences between men and women for the majority of the variables analysed, except for Efficacy, Independence and Cognitive control. This indicates that on the one hand men behaved with more Emotional Stability, Self-knowledge and Self-esteem, greater self-confidence with a tendency to organise and lead the group, but on the other hand, when faced with difficulties, they were more aggressive and hostile. Women had a more tolerant, understanding and flexible profile, were socially more skilful, more responsible, disciplined and sociable, but more anxious, emotionally unstable and with lower self-confidence and self-esteem. Regarding the results of the expression variable and trait anger control and unsportsmanlike behaviours, the data indicate statistically significant differences between men and women for the variable of external anger control and for unsportsmanlike behaviours. In this sense, men showed higher scores than women for physically or verbally expressed aggressive behaviours (see Table 1). The results from the one-factor analysis of variance analysis, used to analyse the personality variables of age groups, reveal significant differences in the Emotional stability, Self-concept, efficacy, Self-confidence, Dominance, Cognitive control, Aggressiveness and Tolerance. The post hoc tests (HSD by Tukey) showed significant differences in the following variables: Emotional stability between the 26-30 group and the 16-20 (I-J = 2.902; p = .001) and 21-25 (I-J = 2.273; p = .019) groups; Self-concept between the 16-20 group and the 26-30 group (I-J = -2.009; p = .015); Efficacy between the 16-20 group and the 26-30 group (I-J = -1.462; p = .048); Self-confidence/Self-assurance between the 26-30 group and the 16-20 (I-J = 2.470; p = .001) and 21-25 (I-J= 1.982; p = .023) groups; Dominance between the 16-20 group and the 26-30 group (I-J = -1.905; p = .030); Cognitive control between 16-20 group and the 21-25 (I-J = -.833; p = .030) and 26-30 (I-J = -1.884; p = .001) groups; Aggressiveness between the 16-20 group and the 26-30 (I-J = 1.801; p = .000) and 26-30 (I-J = 2.626; p = .001) groups; and Tolerance between the 16-20 group and the 26-30 (I-J = -1.045; p = .008) and 26-30 (I-J = -1.741; p = .004) groups. 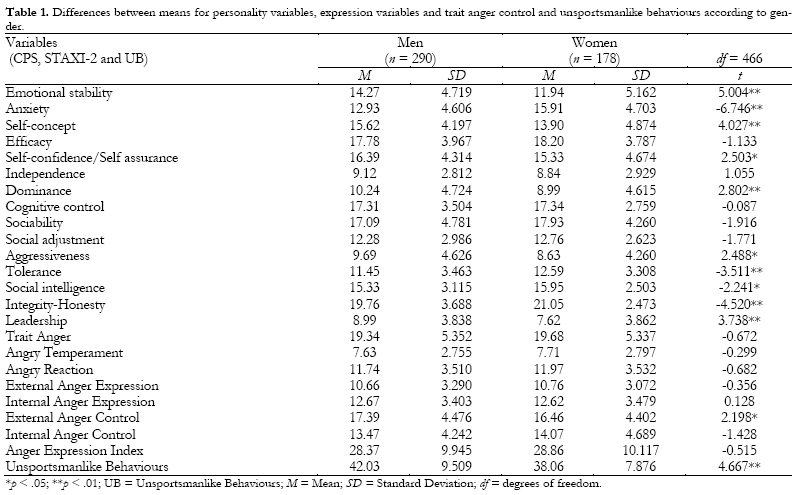 The data indicate worse emotional and social adjustment in the youngest sportsmen and women, since they scored lower in emotional stability, self-knowledge and self-esteem, efficacy, confidence in themselves and their possibilities, emotional self-control tolerance, understanding and flexibility and higher in aggressiveness and dominance (see Table 2). On the other hand, there are significant differences between the age groups for the variables: Trait Anger, Angry Reaction, External Anger Expression, External Anger Control, Anger Expression Index and Unsportsmanlike Behaviours. The post hoc tests (HSD by Tukey) showed significant differences in the variables: Trait Anger, between the 16-20 group and the 26-30 group (I-J = 2.188; p = .027); Angry Reaction, between the 16-20 group and the 26-30 group (I-J = 1.329; p = .046); External Anger Expression, between the 16-20 group and the 21-25 (I-J= .933; p = .012) and the 2630 (I-J = 1.286; p = .030 groups; External Anger Control, between the 16-20 group and the 21-25 (I-J= -1.239; p = .017) and the 26-30 (I-J = -2.150; p = .007) groups; Anger Expression Index, between the 16-20 group and the 21-25 (I-J = 3.069; p = .007) and the 26-30 (I-J = 4.949; p = .005) groups; and in Unsportsmanlike Behaviours between the 1620 group and the 21-25 (I-J = 2.514; p = .018) and the 26-30 (I-J = 4.718; p = .003) groups. 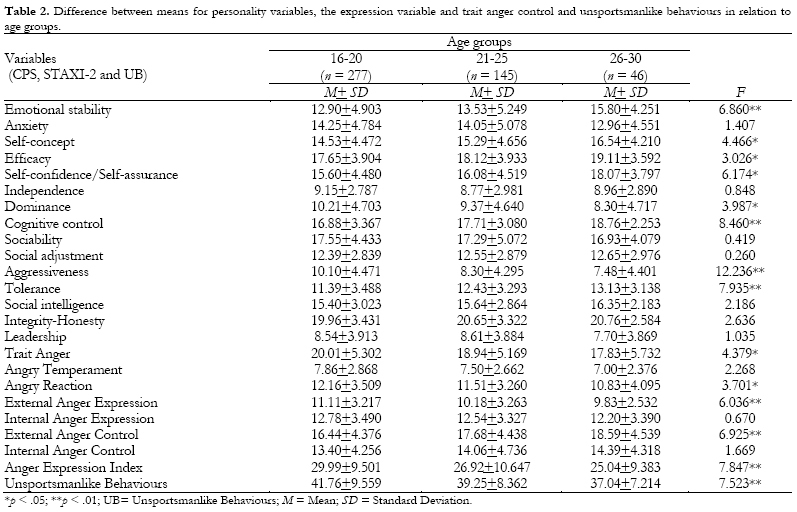 According to this data, the youngest group (16-20), experience more feelings of anger which they express verbally or through aggressive behaviours when they are frustrated, they have more difficulties in controlling it and also behave in a more unsportsmanlike way than the older age groups (see Table 2). No significant differences were observed between individual and team sports for the personality variables. However, there are significant differences in some of the variables for evaluating aggressive behaviours, such as Angry Reaction, Internal Anger Expression and Unsportsmanlike Behaviours. The data indicate that the team sports group subjects express anger when they are frustrated or they are evaluated negatively, more frequently experience feelings of anger that are not expressed and also behave in a more unsportsmanlike way than those who do individual sports (see Table 3). Pearson Correlation was carried out in order to contrast the relation between personality variables and aggressive behaviour. The results in Table 4 indicate moderate correlations between: the Emotional stability variable and Trait anger, Angry temperament and the Anger Expression Index variables; the Tolerance variable and Trait Anger, Angry Temperament and Unsportsmanlike Behaviour variables; the Aggressiveness variable and Trait Anger, External Anger Expression, Anger Expression Index and Unsportsmanlike Behaviour variables; and Unsportsmanlike Behaviour and Trait Anger, Angry Temperament, Angry Reaction, External Anger Expression and Anger Expression Index variables. The data illustrate that sportsmen and women with a high emotional instability express feelings of anger significantly more than in other profiles. Sportsmen and women with a more dominant profile behave more aggressively, hostilely and vengefully. Sportsmen and women with lower tolerance express their anger more and behave more aggressively, hostilely, vengefully and in an unsportsmanlike way. Sportsmen and women with a more aggressive and hostile profile express their anger more and behave in a more unsportsmanlike way. Finally, sportsmen and women with higher levels of trait anger are more unsportsmanlike. 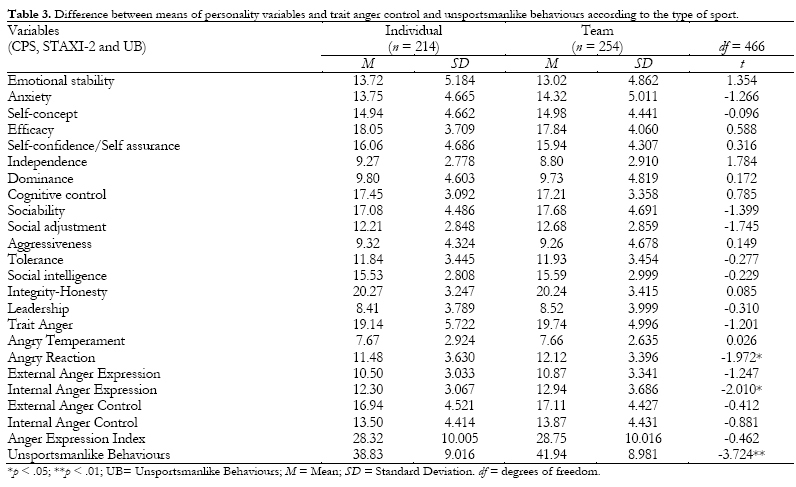 Table 5 shows correlations between the personality variables of the 'CPS'. According to the data, the following variables are highly correlated: Anxiety with Emotional stability; Efficacy with Self-concept; Self-confidence-Self assurance with Emotional stability, Self-concept and Efficacy; Cognitive control with Efficacy and Self-confidence/Self-assurance; Aggressiveness with Dominance; Tolerance with Dominance and Aggressiveness; Social intelligence with Cognitive control; Integrity-Honesty with Efficacy, Cognitive control and Social intelligence; Leadership with Dominance. The following variables are moderately correlated: Self-concept with Anxiety; Self-confidence/Self-assurance with Anxiety; Cognitive control with Emotional stability and Self-concept; Social adjustment with Cognitive control; Social intelligence with Efficacy, Self-confidence and Social adjustment; Leadership with Self-concept, Aggressiveness and Tolerance. Based on this data, we can conclude that the group of sportsmen and women with high emotional stability shows few anxiety behaviours, has a good self-image and self-esteem, high self-confidence and good cognitive control. The group of sportsmen and women with high self-esteem is perceived as more efficacious, has more self-confidence, controls emotions better and has a greater feeling of leadership. The group of sportsmen and women with high efficacy behaves with more confidence, self-control, social intelligence and discipline. Finally the group of sportsmen and women with a high control of emotions behaves with more responsibility and social adaptation. On the other hand, the group of sportsmen and women with a high level of anxiety has a poor self-image, low self-esteem and low confidence. And sportsmen and women with a more dominant profile show themselves to be more aggressive, more leaders and less tolerant and respectful. The step by step multiple lineal regression analysis was used in order to find out which personality variables can favour Anger Expression Index and Unsportsmanlike Behaviours (see Table 6). The Anger Expression Index subscale (IEI) was used as a dependent variable and six were statistically significant: Emotional stability (β=.386; t=6.587; p=.000), Tolerance (β=.262; t=5.522; p=.000), Social Intelligence (β=.148; t=2.719; p=.007), Self-confidence and Self-Assurance (β=.227; t=3.380; p=.001), Efficacy (β=.262; t=5.522; p=.000) and Integrity-Honesty (β=.244; t=3.877; p=.000). Emotional stability explained the highest percentage of variance (17.1%). Consequently, a more emotionally unstable profile with fewer tolerance behaviours and respect towards the way others behave and their actions, fewer social intelligence behaviours (less social skill), fewer integrity-honesty behaviours (less responsibility and discipline) and more self-confidence behaviours were predictor variables from the Anger Expression Index (IEI). On the other hand, on analysing the predictor variables for Unsportsmanlike Behaviours, the variables introduced by the model were: Aggressiveness (β=.410), Efficacy (β=.180) and Leadership (β=.134). The standardized regression coefficients 5 indicate that out of all the predictor variables introduced, Aggressiveness has a greater weight on the criteria variable, since it explains a greater variance percentage (R2= 23%; SE-8.011) and obtains a greater predictive capacity (t=9.206; p=.000). The total contribution to the model by the rest of the variables is quite small since from a R2=23% represented by Aggressiveness it only increases to R2-26.4%. Based on these data, we can conclude that the sportsmen and women who express more aggressive, hostile, intolerant behaviour, respond inadequately in difficult and frustrating situations, feel more insecure and inferior with respect to others and like to lead, direct and dominate, have a higher risk of manifesting Unsportsmanlike Behaviours. The research is, therefore, contextualised within the framework of our interest, which is to analyse personal, emotional, social and environmental variables related to aggressive and unsportsmanlike behaviour in a population of sports competitors. Below we give our conclusions from the most significant results obtained in relation to the objectives that were initially established. With respect to gender differences, men obtained significantly higher scores in the aggressiveness variable of the CPS questionnaire and in unsportsmanlike behaviours. However, no differences were found in the variables that evaluate trait anger from the STAXI-2 inventory, except on the scale External anger control, the highest values being in the sample of men. In contrast to our results, in other studies where the STAXI-2 was applied to normative Spanish samples (Miguel-Tobal et al., 2001), highly significant differences were found between both genders in the Trait Scale and the two sub-scales (Temperament and Reaction). In all of them, women obtained higher scores than men. The External and Internal anger control scales also found significantly higher scores in men. However, in our results significant differences are only observed in External anger control, also with higher values in men. The expression of trait anger is, therefore, found in sports competitors in both genders, while in other populations it is the women who obtain higher values in trait anger and internal anger control. However, the levels of trait anger seem to decrease in females who compete in sports, either through doing sport itself, through the personality profile which as a whole characterises sports competitors, or through both aspects. Male sports competitors on the one hand have a higher risk of expressing aggressiveness and more unsportsmanlike behaviours during a competition, and on the other, they have more anger control. Many anger control behaviours tend to use up a large amount of energy in order to anticipate and prevent the experience and expression of anger. Although this control is desirable, when it is excessive it can lead to passiveness, depression and dropout (Miguel-Tobal et al., 2001). Emotional maladjustments coming from chronic anger could affect sports performance and the capacity to compete optimally. We, therefore, note the levels of trait anger expression and control in the sample of sports competitors are different to other normative samples according to gender. Besides this, significant differences were found in the CPS variable that measures aggressiveness and in unsportsmanlike behaviours, with higher scores in men. This result indicates that the CPS and the STAXI-2 differentiate in the measures for tendencies to manifest aggressive behaviours in both genders. Aggressiveness measured by CPS, besides containing items that evaluate aggressive response (e.g., arguing and insulting) in certain situations and in frustrations as in the STAXI-2, it also evaluates hostile, quarrelsome, intolerant, vengeful and critical behaviours. It is perhaps these other dimensions of the CPS scale of aggressiveness that can explain the differences between the scores obtained in both genders. From an evolutionary perspective of aggression, it is apparent that from the second year of life men are generally more aggressive than women, there being differences in the way they express hostility. Men usually manifest their aggressiveness through physical attacks, whereas women usually do so through verbal attacks or more indirect forms, such as rejection (Owens, Shute, & Slee, 2000). Studies, for example by Loeber and Stouthamer-Loeber (1998), indicate the increase of aggressive acts by women. Others add that in spite of the fact that the differences between genders decrease with age (Maccoby & Jacklin, 1974; Rutter & Giller, 1983), the incidence of aggressive behaviours is still higher in men. (Elliott, 1994; Kroneman et al., 2004). Other studies corroborate higher levels of aggressiveness and unsportsmanlike behaviours in men (Achenbach & Edelbrock, 1986; Cecchini et al., 2007; Stormshak, Bierman, McMahon, & Lengua, 2000; Moffitt et al., 2003; Kroneman, Loeber, & Hipwell, 2004; Garaigordobil & Garcia de Galdeano, 2006; Pelegrin & Garces de Los Fayos, 2009; Pelegrin et al., 2010). This study also identifies different personality patterns between sports men and women. Men have a better emotional adjustment which is apparent in behaviours of more emotional stability, self-knowledge and leadership. They have worse social adjustment, apparent in fewer behaviours of tolerance, social skill and responsibility; and more behaviours of dominance and aggressiveness. Women show themselves as having better social adjustment, with more behaviours of tolerance, understanding and flexibility, social intelligence, discipline and sociability; they have a worse emotional adjustment and fewer behaviours of self-confidence and self-esteem. The more socially adjusted profile in women could explain the lower incidence of aggressive and unsportsmanlike behaviours. Carazo and Araya's study (2010) about the profile of the psychological traits of Costa Rican men and women who do taekwondo, showed that differences linked to gender could only be found in the confidence variable (men had a better score than women). No statistically significant differences were found in the other variables (motivation, attention, emotional sensibility, imagination, positive attitude and challenge). Statistically significant gender differences were also found with the BFQ questionnaire in the dimensions: Affability, Cooperation, Emotional Control; and the subdimensions: Dominance, Cooperation, Emotional Control and Impulse Control. The male group had higher scores in all these dimensions and subdimensions except for Affability and Cooperation, for which the female group obtained higher scores (Ruiz, 2005). In other studies (Garaigordobil, 2009), gender differences have been found in personality variables related to social intelligence where women showed better skills in interpersonal relations than men. A greater incidence of aggressive and unsportsmanlike behaviours was also found in younger sportsmen and women (16-20) in contrast to older sportsmen and women (21-25 and 26-30). Younger sportsmen and women also show themselves to have a maladjusted emotional profile, characterised by fewer behaviours of emotional stability, self-knowledge and self-esteem, efficacy, self-confidence, emotional self-control, tolerance, understanding and flexibility and more behaviours of dominance. A more maladjusted profile in younger sports people could be related to the changes of competitive category they go through until they reach 19, at which age they compete in an absolute category. Experience, maturity and adaptation should also be added to this aspect, which develop with age. In the same line, the study by Garcia, Ruiz, and Pujals (2011) noted that high level adult sportsmen and women were more emotionally stable than juvenile players; they showed more receptiveness to experience than junior players and were more responsible than junior players. Other studies have identified a higher incidence of aggressive behaviours during adolescence, in school populations (Ianni, 1978; Ortega & Mora-Merchan, 1997; Pelegrin & Garces de Los Fayos, 2009; Smith, 1975; Trianes, 2000) and among those who play sport (Pelegrin, et al., 2010). Aggressive and unsportsmanlike behaviours were more frequent in the group that does team sports. In the results for the personality variables, the research did not determine personality differences between different sports. More behaviours of independence, autonomy and self-sufficiency were reported for individual sports and more behaviours of social adaptation and compliance with rules and regulations for team sports, but the differences were not significant. Besides, in spite of having higher scores for social adaptation, the team sports group showed more aggressive and unsportsmanlike behaviours. It is likely that in team sports more aggressive and unsportsmanlike behaviours are expressed towards the rival team intergroup (than towards their own team members (intragroup), which, therefore, maintains a good group cohesion and climate. Other studies have reported the relation between aggressive responses and individual sports, team sports and the level of contact (Endresen & Olweus, 2005). Both more maladjusted (risk) and more adjusted profiles were found in the sample of sportsmen and women. With respect to risk profiles, the more aggressive sportsmen and women (with high scores in trait anger, temperament, anger expression index) scored lower on emotional stability and tolerance; lower levels of tolerance and higher levels of aggressiveness were observed in sportsmen and women with more unsportsmanlike behaviours; sports men and women with a more anxious profile were more emotional unstability, a poor self-image, lower self-esteem and self-confidence. These results show that aggressive responses can indicate emotional maladjustments in sports competitors which, without a suitable intervention could affect their sports career. In other studies, the relation between emotional maladjustment and aggressiveness has also been proven (Caprara & Pastorelli, 1996; Coie & Kupersmidt, 1983; Ladd et al., 1990; Mestre, Tur, Samper, & Latorre, 2010; Pelegrín, 2005, 2008). More aggressive sportsmen and women also show more leadership, are more dominant, intolerant and unsportsmanlike. It can also be noted that there is a link between Sportsmen and women who show behaviours of leadership and have a more aggressive, hostile, intolerant and dominant profile and competition. In this context, according to the trait model of personality, young people with chronic aggressiveness, show a high level of self-centredness and competitiveness, as well as a low level of cooperation and concern for others (Pepitone, 1985; Slavin et al., 1985). Research in literature (DeRosier, Cillessen, Coie, & Dodge, 1994; Hartup, 1983; Smith & Boulton, 1990) has suggested that competitive games favour the appearance of aggressiveness, while aggressive behaviour is less likely to appear in cooperative games (Coakley, 1990; Devereux, 1976; Dodge, Coie, Pettit, & Price, 1990; García-Ferrando, 1986). In other studies, with samples of young sportsmen and women (Pelegrín, 2004) the competitive group shows more inconsiderate behaviours and less respect towards the peer group, low self-control behaviours and more anti-social behaviours. In contrast, we have found more emotionally and socially adjusted profiles of sportsmen and women. Sportsmen and women with better emotional stability showed few anxious behaviours, better self-image and self-esteem, more self-confidence and cognitive control. Sportsmen and women with better self-esteem are perceived as more efficacious, with more self-confidence, a greater control of their emotions and more leaders. Sportsmen and women with high efficacy show more self-confidence and more self-control, more social intelligence and more discipline. Sportsmen and women who have better control of their emotions are more responsible and better socially adapted. Out of the emotional and social variables analysed, emotional stability, tolerance, social intelligence, efficacy and integrity-honesty are seen to predict anger expression negatively and self-confidence and self-assurance positively. Emotional stability (negatively) is the variable which better explained anger expression. Therefore, a more emotionally unstable profile with fewer tolerance behaviours and respect towards the way others are and act fewer behaviours of social intelligence (less social skill), fewer behaviours of integrity-honesty (less responsibility and discipline) and more behaviours of self-confidence were predictor variables of the Anger Expression Index. This study also highlights some predictor variables of unsportsmanlike behaviours, such as: many aggressive, hostile, intolerant negative behaviours, few behaviours of efficacy (assurance, confidence and responsibility) and many leadership behaviours. These results indicate the need to develop intervention methodologies which stimulate emotional and social variables in order to prevent aggressive and risk (maladjusted) profiles in competition sports. An intervention focusing on improving emotional and social aspects through training in psychological skills, would not only favour performance and more success in sports, but would also prevent dropout in the under 20 competitors. Other studies have identified that certain emotional and social variables can act as protector variables from aggressive behaviours, for example: more social skill behaviours (Coie et al., 1982; Dodge et al., 1986; Ladd et al., 1990); more self-control (Guerra et al., 2003; Pelegrin, 2004; Pelegrin & Garces de Los Fayos, 2008; Trianes, 2000); more consideration and respect towards others (Dodge et al., 1986; Pelegrin, 2008; Pelegrin et al., 2010); and fewer hostile behaviours (Dodge & Coie, 1987); less frustration (Berkowitz, 1969; Cohen, 1955; Dollard, et al., 1939; Volkamer, 1971; Worchel, 1974). Based on the analysis of the variables, risk groups were identified in sportsmen and women, who have a greater emotional and social maladjustment and a higher incidence of aggressive and unsportsmanlike behaviours. In contrast to this, more adjusted profiles were also identified in sportsmen and women. Differences between genders, age groups and the type of sports were also appreciated and a greater risk of showing aggressive and unsportsmanlike behaviours was observed in men, adolescent sports men and women (16-21) and in team sports. Finally certain variables such as, emotional instability, intolerance, lack of social skills, hostility, insecurity and lack of confidence are the ones which better explain aggressive and unsportsmanlike behaviours in the target sample of this study. This study brings to light the possible implications in the context of psychological interventions in sport. Risk profiles with a high level of emotional and social maladjustment in young, sportsmen who compete in team sports were found. This gives rise to the need to stimulate emotional and social variables (for example, emotional stability, self-confidence, self-esteem, efficacy, tolerance, respect, social skills), in order to prevent aggressive behaviours and unsportsmanlike behaviours in sports competition. Not only would this intervention improve the psychological aspects of sportsmen and women, but it would also benefit performance. In future studies, it would be interesting to analyse emotional and social variables and their relation to aggressive and unsportsmanlike behaviours in under 16 sports competitors, as well as in people who do non-competitive sports and those who do not do any sport. The limitations of this study to be highlighted lie in the fact that the correlational nature of the data contributes little to the causal relation that may exist between the variables. Another aspect to be considered is the use of measurement instruments which complement and broaden the relationship between personality variables and aggressive and unsportsmanlike behaviours. Besides this, it would of interest to carry out a study of the relations between the target variables, by considering the type of sport, level of contact and type of competition (regional, national or international).